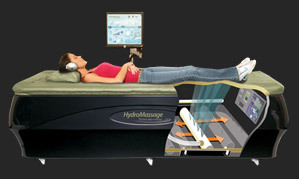 Princeton Clubs feature Hydro-Massage beds. Imagine lying comfortably on a bed with pressurized heated water giving you a massage that you customize to your liking. Whether you want to spend your massage being completely relaxed, working on sore muscles, or rejuvenating your mind you will absolutely love your Hydro-Massage session every time. With incredibly affordable unlimited usage packages get one for you or as a gift. With convenient 24 hour access to the massage bed it just might motivate more regular workouts!